With the NATO drawdown, Afghanistan’s neighbors will have a growing role to play in the country’s stability. With Afghanistan’s presidential election likely heading for a second round, it may be some time before the result is known. One issue the new president will need to address, though, is the Bilateral Security Agreement with the U.S., which incumbent Hamid Karzai has resolutely refused to sign, despite considerable pressure from the U.S. and the looming pullout of the International Security Assistance Force (ISAF). Karzai’s stance may seem baffling, especially since the BSA was endorsed by a Loya Jirga last November. But he may be making a pragmatic judgment as to Washington’s long-term ability to keep the peace in Afghanistan. The “zero option” that Washington has enunciated, if executed, will create a power vacuum in Afghanistan. Even if that option were avoided and a limited American force of approximately 3,000 were maintained, there would still be a steep drop in area dominance capabilities, with Afghan National Security Forces left almost entirely in charge. The Taliban would doubtless attempt to fill the vacuum. Equally certain, Afghanistan’s neighbours would not be comfortable with a radical Taliban exporting terror to their countries across porous borders. Even those that do not share borders with Afghanistan would be concerned. What role might these countries play in the wake of the NATO drawdown? Among Afghanistan’s more powerful neighbors is Iran. A Shia-majority nation, it feels a sense of responsibility for the considerable Shia population in Afghanistan. The two countries also share ethnic and linguistic overlaps. Iran’s concern for the Shia of Afghanistan is evidenced in its past responses. Following the 1979 Russian takeover and Afghan resistance, Iran provided support for the Persian-speaking Shia groups. When the Taliban came to power, Iranians supported the Northern Alliance partners. In 1998, when the Taliban overran Majar-e-Sharif and massacred thousands of Hazaras and 10 Iranians with diplomatic papers, Iran deployed its Army along its borders with Afghanistan. Iran also faces a serious drug problem, with Afghan opium smuggled across its borders. Moreover, it hosts more than two million Afghan refugees. In the recent past Iran has sought to increase influence primarily through economic avenues. It has built roads, improved infrastructure, and provided concessions enabling Afghans access to Chabahar Port, allowing Kabul to avoid relying solely on Karachi. A railway link connecting Afghanistan with Iran and Tajikistan is under construction. Afghanistan has agreed to a friendship and cooperation pact with Iran. Iran’s deepening involvement in Afghanistan will undoubtedly not be welcome in all sections of Afghan society. Internationally as well, significant dissonance can be anticipated. However, progress with the interim agreement on Iran’s nuclear program has improved its image in the U.S. and NATO countries, which may be more willing to accept a greater Iranian role in Afghanistan. The Central Asian Republics (CAR) have deep interests and substantial stakes in Afghan stability. For those that share borders with Afghanistan the most important issue is radical outfits potentially exporting terror and fundamentalism to their countries. There are also sizeable ethnic minority groups in Afghanistan with strong ties to the CAR. An Afghan government collapse would likely prompt an exodus of refugees to the CAR, creating economic, security and political problems. In the 1990s, the CAR attracted relatively few refugees; today, their better economic conditions make them attractive options for those wishing to flee a violent and unstable Afghanistan. Before the Taliban came to power in Kabul, the CAR extended economic aid to Kabul in a bid to provide stability. Today, while individually these countries may not be able to influence issues in Afghanistan decisively, they could contribute to a force under a UN flag, if such a force were deployed in Afghanistan. China has hitherto displayed only an economic interest in Afghanistan. Beijing is cognizant of the threat of an unstable Afghanistan and the possible destabilizing influence it could have in China’s west. Its huge economy would be well served by the vast mineral deposits of Afghanistan, and China is presently pursuing infrastructure links through the neighboring CAR countries, with rail and road projects already underway. China will want to maintain a lower profile in Afghanistan, as ethnic differences and a lack of strong historical links may alienate the local populace. Chinese-funded projects in Myanmar employing large Chinese workforces have already faced similar situations. Beijing will also be quite happy with the U.S. footing the bill for Afghan stability, with or without the requisite boots on ground, while China draws on Afghan natural resources to fuel its growth. When it comes to political influence, China can deploy a slew of economic incentives while also leveraging what influence Pakistan has to achieve its objectives. However, China would be uncomfortable dealing with the Taliban. The recent attack in Kunming is bound to make Beijing more cautious about fundamentalists from Afghan soil reaching out to already troubled parts of its own territory. As far as Pakistan is concerned, its traditional philosophy of Afghanistan providing it strategic depth in a confrontation with India makes it imperative that any regime in Kabul be subservient to Islamabad. A stable Afghanistan with Kabul under its influence is central to Pakistan’s Afghan strategy. If violence erupts on a large scale in Afghanistan, Tehrik-i-Taliban Pakistan, which has bases in Afghanistan, will need to relocate to the Northwest Frontier and Federally Administered Tribal Areas, exacerbating the problems Pakistan already faces. Islamabad is reported to have advised the Karzai government to form stronger bonds with China. A China-Pakistan dominance with China pouring in the funds and Pakistan acting as the mentor for Kabul would suit Pakistani interests nicely. Pakistan will also contest any move by India to establish strong political and military influence in Afghanistan. The fear of being hemmed in by Indians to the East and an Afghan regime with Indian leanings to the West obsesses the Pakistani establishment. Russia will of course wish to avoid a rerun of its bitter experience in the 1980s. The fact that it no longer shares borders with Afghanistan dilutes its concern. Moscow will naturally be sensitive to insurgent groups based in Afghanistan developing adequate reach to find footholds in CAR countries that remain in Russia’s orbit. 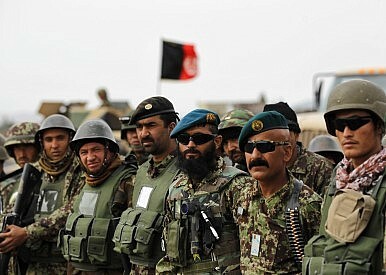 Moscow is also on record as having stated its readiness to maintain Afghan military equipment. India lacks the capability to field a large force in Afghanistan for any protracted period. Moreover, Pakistani opposition and the fact that India and Afghanistan do not share land borders rules out that option. Still, India maintains a good image among Afghan citizens. Should Iran play a major role in Afghanistan, India may have an opening to step up its role. Indians and Chinese could also work together: Both countries want a stable Afghanistan, have invested substantial capital in the country, and anticipate business opportunities. New Delhi could, for instance, help train Afghan forces. The sudden deterioration of the situation in Ukraine raise issues of import for Afghanistan’s future. The U.S. rebalancing to Asia, its deteriorating relationship with Russia, and the ongoing global war on terror barely permit it the resources to police Afghanistan as well. Western priorities are shifting, and the focus on Afghanistan is fading perceptibly. Combined with greater acceptance of Iran by Western powers and the steady rise of China, new equations in Afghanistan are all the more probable. Afghanistan will in all likelihood require the deployment of outside forces to maintain stability after the ISAF withdrawal. Even if the zero option is not executed, and a force of approximately 3,000 or even 15,000 remains, the Taliban is likely to gradually expand the areas under its control. Neither the U.S. nor EU countries will have the appetite for another redeployment at that stage. The Russians will not want to get involved. With Indians out of contention and the Chinese unlikely to pursue anything beyond business interests, a multi-national force drawn primarily from regional countries may be the most viable option. The dynamics of such a force would likely be stormy. Pakistan will want to dominate; however, its own relations with Afghanistan are riven by tensions. Afghans blame Pakistan for many of the issues that ail their nation. Without a major role, Pakistan would play the same games it has played with the ISAF; perhaps with more violence if an Indian contingent also takes the field. Consequently, any multinational force operating in Afghanistan following the departure of the ISAF would perforce be mostly from the CAR, with possible contributions from Iran and perhaps India. Amidst disagreement with the U.S., Karzai seems to be looking at other post-2014 options.